The first question in this series of blog posts I ask as I move toward a decision with Brownhill Creek is this …. Brownhill Creek what are we trying to address. I have doubt in my mind that we truly do know what we are trying to achieve. We are on the surface designing a scheme to deal with a nominal 1 in 100 year flood with whatever i mpact that may have. I believe that there are two factors have impacted heavily on this. Firstly we are trying to protect properties along and adjacent the creek. The debate however has centred on dam v no dam. The voices of those who live on or near the creek have subsequently been (pardon the pun) drowned out during the public debate. The second and what I want to focus on here is the goalposts have shifted in the time I have been involved. 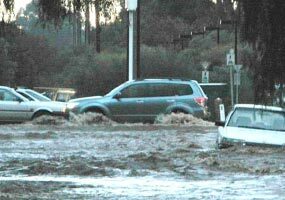 The Bureau of Meteorology have come up with revised statistics for predicting a 100 year flood with Adelaide’s rain fall getting less. We are being told to expect that our rainfall is going to get less annually, that there will be fewer events but that the rainfall intensity per event will be higher. Curiously we have a design now that is expecting less severe floods than that we were contemplating when the 5 councils agreed to look at no dam solutions. There are now very few if any above floor flooding situations along the creek than what we were originally expecting. If this is so and I struggle that it would be with more intense rain events then we would expect I believe that the cost of repairs from flooding would reduce from what we were advised back in 2012. And yet the cost of all the mitigation solutions currently proposed has increased from one that was very much similar to after the fact repairs back then has risen sharply. I spite of asking I have yet to be advised by the project what they expect the cost of repairs would be now so that we can compare it against mitigation. We could do that in 2012 when it was a basis used for justifying mitigation against doing nothing but not now it would appear to be considered as irrelevant. I doubt that this information will become available and it is critical in my mind to the solution. Without this information I believe we cannot truly make a responsible decision. Let’s face it, this information may tell us that economically we do not need to take any action based on current hydrology. Pingback: Cr. Don PalmerNever mind Options B1, B2, D what about do nothing?